Imagine the scenario: A board of directors talks about attracting new customers from a specific demographic category, with no representation from that demographic category at the table. For many of us, it’s not hard to imagine. We’ve participated in board meetings where we’ve talked about ways to get younger members involved—with no younger members involved in the discussion. Or, we’ve participated in board meetings where the discussion has focused on how a business can more effectively market to specific minority communities—with no one from those communities in the room. How successful are those outreach efforts going to be? A group of older board members guessing what may appeal to millennials without hearing from real, live millennials, or a group of male board members brainstorming about how to attract more female customers is probably not going to work. Personally, I’ve witnessed this phenomenon time and again when it comes to the way boards of directors talk about millennials. Because there are often no millennials on a board, the conversation is almost always fixed on a decade-old stereotype of a millennial. This stereotype fails to recognize that the 24-year-old in 2007 is now 34, and statistically speaking—even with the tendency of that generation to marry and have children later—is likely to be a married parent who has long since traded their skateboard for a minivan. Yes, diversity matters for its own sake. For reasons of equity and fairness, it is important that the leadership of an organization reflect the stakeholders it serves. However, the millennial example illustrates the fact that there is a bottom-line benefit to having a diverse board. If your organization wants to attract millennial customers, members, or donors, having board representation from that demographic is crucial. Every board I’ve ever worked for has included smart, talented, wise people—but the idea that 10 people from the same generation, same income bracket, with the same educational level, who largely come from the same gender, race, and class, have all the perspective needed to guide an organization in an increasingly diverse world is just incorrect. Millennials have overtaken Baby Boomers as the largest living generation. More women than men are attending college. There are about 60 million Hispanic people living in the United States. A board of directors that recognizes these realities and works to actively increase diversity isn’t just doing the right thing; it is doing the strategic thing. A board composed entirely of older white males isn’t poorly constructed because there is something inherently wrong with older white males; it’s poorly constructed because it will lack the perspective of a growing number of stakeholders. If you lead a community bank that wants to make customers out of a growing Hispanic middle class, adding Hispanic entrepreneurs to your board is a smart strategy. If you lead a trade association that wants to get more millennial members, identifying millennial leaders and adding them to your board will be far more effective than relying on articles written about millennials. One way to help make your board more attractive to millennials is by implementing technology that is familiar to younger directors. BoardPaq brings your board of directors into the 21st century with the most cost effective board portal on the market. 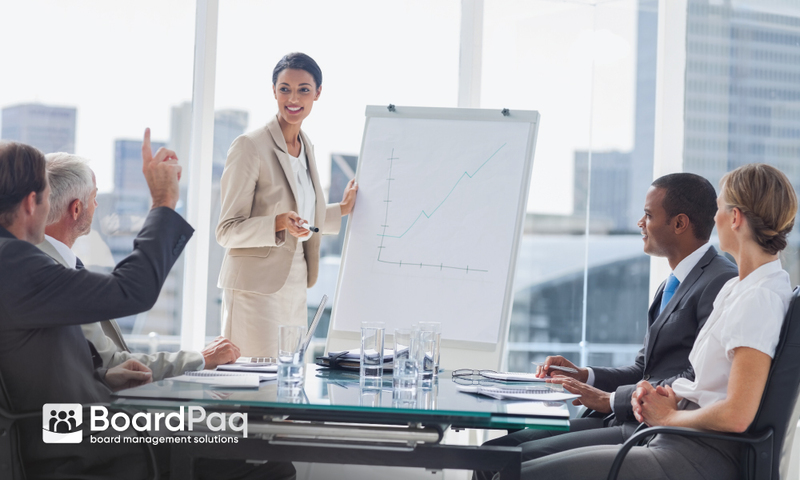 Sign up for a demo today, and learn why more than 1,000 community banks, co-operatives, trade associations, school districts, nonprofits, and other cost-conscious organizations have chosen BoardPaq to be their paperless solution for board meetings.